Technology ke yug me koi kam impossible nahi hai. Technology ke kuch secret code ke dara bahut sara details hasil kiye ja sakte aur bahut sare problem ka pata karne aur solution prapt kiya ja sakta hai. Aise hi sumsung , Nokia , Micromax , karbonn , LG, Spice ke me mobile ke secret code ke bare me apko batuga. Agar password bhul gaye hoto bina sim ke ye code dial kare. Code dalne ke bad screen par E2p custum reset aata hai. Lekin new phone me screen par na akr restart ho jata hai. Apka phone unlock ho gaya. up aur down ka button dabakar menu me display ko adjust kare. Ab on / off buttun press kare. THEORY: Home automation is one of in demand concepts in today’s world. Hobbyists do simple automation systems with the components readily available. If we are more concerned about the reliability and performance of the system, then we can go for the expensive Home Automation Consoles. Home automation reduces the physical efforts and integrates the control for any number of appliances in to a single control unit. 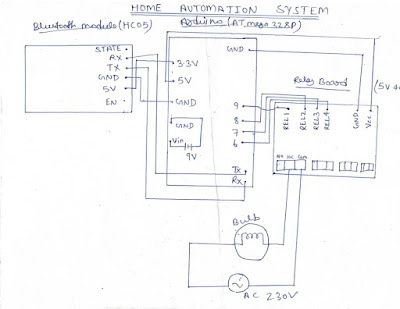 Hence, a simple home automation system is a remote control of different electrical appliances i.e. turning them on or off with the help of a remote. There are many ways to implement this remote control system. With the extensive use of smart phones and tablets, Bluetooth may be the best option to implement the home automation. And one is implemented here in Bluetooth based Home Automation using Arduino. Note: COMPONENT OF PRICE BASED ON AMAZON. Working of the Project: Home Automation System is a useful and helpful way to manage electrical appliances without any physical contact with the switch. This is possible by utilizing the wireless communication technologies. 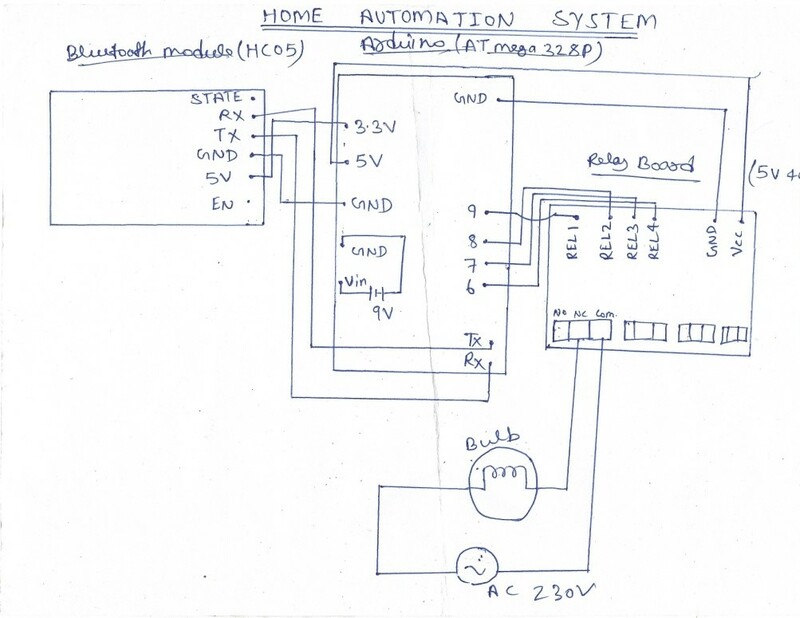 In this project, anbased home automation system is implemented using Arduino. The working of the project is explained here. This is an advanced way of controlling home appliance from a conventional manual switch pressing system. It uses an Android mobile with a user graphical interface application in it. The control circuit is attached to a number of devices to be controlled through a relay mechanism with a Bluetooth communication module. First, this Android mobile has to pair with the receiver side Bluetooth modem; once it is paired with the modem, user can send control signals to corresponding appliance to control it. At the receiver side, microcontroller manages the all the actuators for different loads depending on the control signals from the user. APPLICATION OF THE PROJECT:Some general applications of the home automatic system are light on or off, fan, school automation and industrial etc. ADVANTAGE: By using a home automation system, we can save a lot of time to operate home appliances.